The ePrescribing State Law Review is a subscription-based consulting service that delivers state and federal ePrescribing regulatory intelligence. Prefer a snapshot of our latest regulatory content, rather than an ongoing subscription? The ePrescribing State Law On-Demand research brief details enacted ePrescribing regulations for all 50 states and Washington, DC. Click here for a comparison of these products. The ePrescribing State Law Review combines access to Point-of-Care Partners regulatory experts with timely analyses of evolving laws and regulations governing electronic prescriptions. 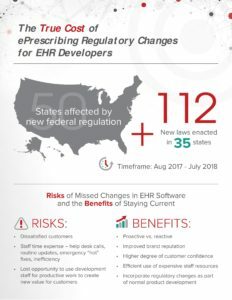 The service includes perpetually updated data sets for all 50 states and Washington, DC that provide the foundation for companies with a stake in ePrescribing to easily assess their compliance with state and federal rules and regulations and to stay ahead of the evolving eRx landscape. What does the Law Review cover? Fully updated quarterly with intermittent alerts for urgent changes, the Law Review covers ePrescribing regulations for the 50 states and Washington, D.C.
How do I access the review? 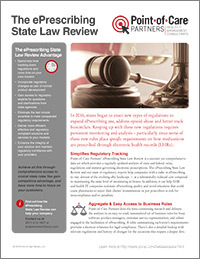 Contact us to receive more information about the ePrescribing State Law Review.